Installed just weeks ago, the new tower and antenna will make it possible for 88.3 The Journey to reach an additional 400,000 people. 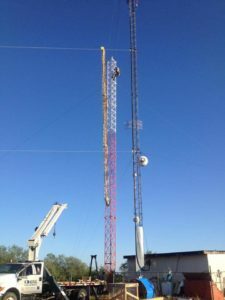 With the installation of its new tower and antenna, 88.3 The Journey is now broadcasting a stronger, clearer signal than ever before, reaching an additional potential 400,000 listeners. “We reach listeners in Cedar Hill and Hillsboro now, and that is farther than we have ever gone before,” says Mike Agee, general manager of 88.3 The Journey. It’s taken nearly five and a half years to make the new tower possible. Detailed research was completed before the new tower could be installed. Investigation included making sure the soil for the tower was acceptable, no ancient burial grounds would be disturbed, nor migratory bird flight paths interrupted. 88.3 The Journey contacted the Federal Aviation Administration (FAA) to clarify which height would be acceptable for the new tower, since the tower is near flight patterns for airports in south Ft. Worth. Once that was settled, it was time to start fundraising. It took $175,000 to build the new tower and antenna. The Federal Communications Commission (FCC) approved the application to change the radio station within a couple of days. “In 38 years of broadcasting, I have never seen this happen so quickly,” says Agee. “In Idaho, I waited seven and a half years for one application. To get one in a couple of days was unbelievable.” Agee hopes with the increase in potential listeners, the radio station will be able to get more funding, providing resources to be more involved in the local community.